The United States Coast Guard’s search-and-rescue division is considering some of the same trade-offs that are found in better-known safety-net programs related to unemployment and health care. Among other duties, the Coast Guard rescues people in, on and near United States waters. In addition to having highly trained life-saving personnel, the Coast Guard has ships, helicopters, planes and some of the world’s most modern life-saving equipment. Taxpayer financed, the Coast Guard every day offers its services free of charge to the people it rescues. In that regard, the search-and-rescue part of the Coast Guard is a kind of safety net –- taxpayers pay so that people can have help on the rare occasions when they need it. In fact, these search-and-rescue activities predate Medicaid and unemployment insurance; the Coast Guard can be traced back more than 200 years to a private search-and-rescue organization in Massachusetts called the Humane Society. Safety-net programs have what economists call “moral hazard” as an unfortunate byproduct: recognizing that the government is standing by to help, some people do too little to take care of themselves. For example, a significant fraction of unemployed people delay finding a new job until their benefits run out. This may not be a choice we condone, but because unemployment insurance makes unemployment a little less painful, some people will respond by doing less to exit unemployment. In their marine rescue efforts, the Coast Guard has noticed that many boaters do not wear life jackets that can prevent or delay drowning, and a number of boats venture miles offshore without a radio beacon that can help rescuers find troubled boaters. Unfortunately, some boaters’ imprudent actions may actually be the result of the Coast Guard’s life-saving proficiency. Boaters know that they can call the Coast Guard when their boat takes on water, catches fire or otherwise becomes disabled, and many times help will arrive before the boaters have to leave their vessel and jump in the water. The Coast Guard even has ways of locating people who do not have radio beacons. President Obama signed a health care law that will require Americans to get health insurance. Although less known, President Obama also authorized the Coast Guard to consider mandating radio beacons for boats venturing offshore and mandating that boaters wear life jacket in many situations (the Coast Guard has long required boaters to have life jackets on board, even if they are not worn). Although it is sometimes asserted that the federal government has limited legal power to mandate citizens’ purchases, there can be a good economic case for mandates. While economists are often not inclined to interfere when a person knowingly risks his life for thrills or any other reason, the fact is that our government is in the safety net business, so individuals may take risks without recognizing the costs they create for rescuers. A boat owner may save himself a few dollars by forgoing the purchase of a radio beacon, and that can ultimately cost the Coast Guard –- and thereby American taxpayers –- a great deal of money in search-and-rescue resources. Over all, it might be cheaper if the owner were force to make the purchase. On the other hand, it is possible (although not logically necessary) that mandating marine safety equipment may encourage dangerous activities on the water, because the safety equipment reduces the costs of dangerous activities. Years ago, Prof. Sam Peltzman of the University of Chicago found that mandating the wearing of seat belts in automobiles resulted in more dangerous driving and more accidents, because, thanks to the seat belts, the average accident was less deadly. As always, helping people has its side effects, and some rescues are necessary because the safety net exists. Payroll taxes are by no means the only thing that stops people from working, but one of President Obama’s payroll tax cut proposals could nonetheless create a million or more jobs. Last week I estimated that the president’s proposal to cut the employer portion of the payroll tax by 3.1 percentage points could raise employment by more than a million, and maybe as much as three million. You might (as some readers wrote to me) think that a payroll tax cut is not, by itself, a good reason for employers to hire, and on that basis conclude that my estimate is way off. I agree that jobs are not created by payroll tax cuts alone, and my estimate reflects that fact. About 131 million adults are working now, and 109 million adults are not working. If I’m right that the payroll tax cut would raise employment by one million to three million, that means that 106 million to 108 million adults would still not be working despite the payroll tax cut. 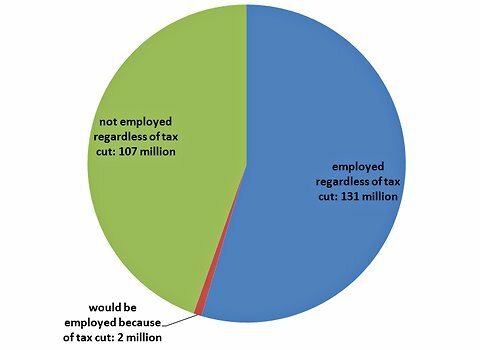 The chart below illustrates the results for the case that the payroll tax cut raises employment by exactly two million. In other words, my estimate is that at least 97 percent of people not working would still not be working regardless of the payroll tax cut. That’s because, as you might deduce, payroll taxes are only one factor among many that determine how many people are employed. Nevertheless, raising employment by one million to three million would be an accomplishment for the president, and one that would be visible in the national statistics. By the same logic, if someone were to propose raising the payroll tax by 3.1 percentage points, I would expect employment to be reduced by one million to three million. Again, the payroll tax is only one of many factors affecting hiring decisions, which is why my estimate of a payroll tax increase implies that more than 97 percent of workers would continue to work despite the increase. Indeed, we all know people who would continue to work even if the payroll tax were raised by 30 percentage points, let alone three. We also know people who would not work even if taxes were eliminated completely. But the fact that more than 100 million people are not employed, and more than 100 million people are employed, suggests that there could well be a million people (or two million, or three million) who are near the fence. For that small fraction of the population, there are almost as many things pushing toward making them employed as making them unemployed; a payroll tax cut could tip the balance. For hundreds of millions of others, the balance is tilted too far for a payroll tax cut to make a difference. But while economists can debate the exact numbers, few of us can conclude that a small tax cut has no effect. Rather, a small tax cut should be expected to have a small effect — and at this point one worth seeking. Last week President Obama proposed a collection of policy changes, including payroll tax cuts, unemployment benefit extensions and new infrastructure projects. The latter do not have much job-creation potential, because they reduce private-sector activity in the short run. But they can be desirable for the infrastructure they produce, and because doing some of those projects now would be cheaper than doing them later. Unemployment compensation may be compassionate, and for that reason alone might be the “right thing to do.” But an unfortunate side effect of unemployment compensation is that it reduces employment by discouraging people from seeking and retaining jobs. The real job-creating potential in the president’s proposals comes from one of its payroll tax cuts. The payroll tax is the second most important tax in the United States, normally bringing in almost $900 billion a year through a combination of taxes on employers and employees — about 15 percent of payroll. Although workers may not realize it, most of them pay more payroll tax than they pay in federal income tax. The president proposes cutting the employer portion of the payroll tax by 3.1 percentage points (bringing the combined total down to about 12 percent) for employers with less than $5 million in payroll. Unfortunately, this last condition is business-distorting. Why encourage a $10 million business to split into two $5 million businesses? Nevertheless, the 3.1-percentage-point part of the president’s proposal could raise employment by at least a million, albeit the duration of job creation is related to how long the tax cut lasts. I expect that every percentage-point reduction in employers’ costs raises employment by about a percentage point and real gross domestic product by about 0.7 percentage point. That means employment could be roughly three million greater during the period of the tax cut than it would otherwise. The tax cut is proposed to last a year, and some of the estimated three million incremental job-years — a job that lasts a year, or 12 jobs that last a month — could be spread over time. So we might see only two million in the first year of the cut, with another one million after the cut expires. But still that’s a lot of jobs. The other part of Mr. Obama’s payroll tax cut proposal is more complicated — and counterproductive. It would reduce the employer’s proportion of the payroll tax by 6.2 percentage points for increases in its payroll spending. Assuming that this payroll tax change would be in place in 2012, the payroll spending subject to the reduction would be the difference between the 2012 payroll and the 2011 payroll. Because this part of the cut is based on the payroll difference, it makes expanding the 2012 payroll cheaper — presumably the intention of the law — but it makes it cheaper to contract the 2011 payroll. That could be part of the reason why employment so far in 2011 has been so low; if you think that tax credits for new hires will catch employers completely by surprise, remember that the Obama administration has been floating ideas like this for three years. To see this, consider an employer that would have a $1 million payroll in both 2011 and 2012. With the normal rates in place, that employer and its employees would owe a combined $150,000 in payroll taxes in each of the two years (15 percent of payroll; for simplicity I have put to the side payroll tax caps and a employee-side cut that has been in place since Jan. 1), or a total of $300,000. If this employer decided to increase its 2012 payroll by $100,000, that would add a total of about $15,000 to the tax bills under the normal rates, but only about $9,000 under the proposed cut. In other words, as intended, the proposal makes 2012 payroll expansion about 6 percent cheaper than it would be under the normal rates. However, if the same employer decided to cut its 2011 payroll by $100,000, that would subtract a total of about $15,000 from the tax bills under the normal rates, but subtract a total of $21,000 from the tax bills under the proposed rates — if the payroll cut was restored in 2012, since that part of the payroll would benefit from the reduced payroll tax rate. Contrary to the policy’s intentions, it makes cheaper certain types of payroll reductions, namely those reductions that occur before the law goes into effect. While President Obama’s proposals have some real job creation potential, it remains to be seen whether any of them become law and whether the job-creating policies are packaged with too many job-destroying policies. A few quick google searches (items published Sep 1 - 7 AM) on coverage of the "Jimmy Hoffa speech." Who Lost Work During the Great Recession? Young people have seen their work hours drop the most during this recession, while the elderly are actually working more than they did before. Using data from the Census Bureau’s Household Survey via the National Bureau of Economic Research, I calculated the average hours worked by age for 2007 (people not working during the week of the survey count as zero hours worked) and then again for 2010. The chart below displays each age group’s percentage change from 2007 to 2010. For example, the chart shows that the average 16-year-old in 2010 worked 40 percent fewer hours than the average 16-year-old did in 2007. 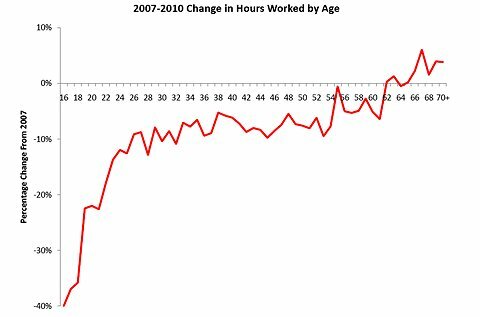 We all know that hours worked in 2010 were considerably fewer than they were before the recession began, which the chart shows: most of the age groups have a negative percentage change. But the chart also shows that labor losses lessen with age and are positive for a number of age groups. In percentage terms, work hours fell the most for teenagers, reflecting the high teenage unemployment rate. After the teenagers, work hours fell the most for the age groups 20 to 29. Work-hours losses for groups in their 30s and 40s ranged 5 to 11 percent. Work hours also fell for age groups 50 to 59, but typically less in percentage terms than for the age groups aged less than 50. As I noted a few weeks ago, average work hours actually increased for the oldest age groups. Seniority layoff practices would tend to reduce hours worked most for young people because, naturally, they tend to be employers’ more recent hires. You might think it would make sense for employers to retain their most experienced workers, but downsizing employers tend to offer and encourage early retirement to people in their 50s and early 60s, who are paid more than recent hires and are starting to think about leaving the workplace. Yet the chart does not show especially large declines in hours for those age groups (nor can seniority practices by themselves explain why the elderly end up working more). Of course, an employer that shuts down does not lay off based on seniority but lays off everyone. Another possibility is that the labor market distinguishes, at least in a rough way, among workers according to their willingness to work, and that the stock market and housing market crashes have especially stimulated older people to work more. (Young people, on the other hand, had fewer assets before the recession, so a decline in asset prices has little direct impact on them.) This effect tends to increase with age because the propensity to own assets for current needs and future retirement also increases with age. To the extent that minimum wages reduce employment of people who would otherwise earn a wage less than the minimum, the minimum wage increases of 2007, 2008 and 2009 may be another factor, because propensity to earn near the minimum wage tends to decline with age (although that propensity is not particularly low for the elderly, who do not have work-hours losses on average). It is also possible that the ability to efficiently find a new job in a tough labor market is a skill, and people tend to accumulate that skill with age. Economists are still digesting the labor market data from the Great Recession, but for now it appears that getting back to the pre-recession labor market especially requires creating jobs for young people.